Are you ready to come CELEBRATE with GERALYN? We ARE! We will be having her book signing and truck show on Friday, September 13, 2013 at 1:00 pm. AND 6:00 pm. She will also be here on Saturday at 8:00 am AND 9:00 am during Saturday Sampler to sign your books. 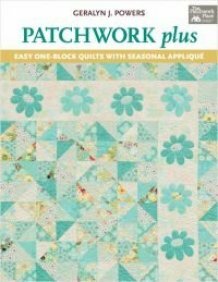 We will be offering a $10.00 rebate on any Martingale/That Patchwork Place book purchased from us. All you have to do is mail in the completed form and a copy of your receipt. This rebate will be available to use on Geralyn's new book! 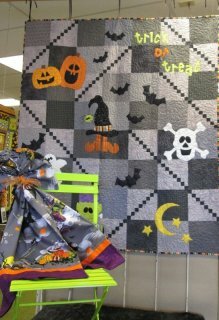 This quilt is just a sneak peak of what is in Geralyn's new book, Patchwork Plus! Isn't it so fun? We will also have our annual FALL FRENZY! September 12, 13 & 14, 2013. We will be open late on Friday night and all bolted fabric will be 20% off (1/2 yard cuts or more) and all remnants will be 1/2 price.